Cornish oafs are a hilarious Cornish duo closely recognised with Cornish comedian, Kernow King. Luke and Liam from Bodmin produce YouTube videos themselves, where they teach simple phrases and words of the Cornish language with hilarious skits in which they use as a tool to help teach others. 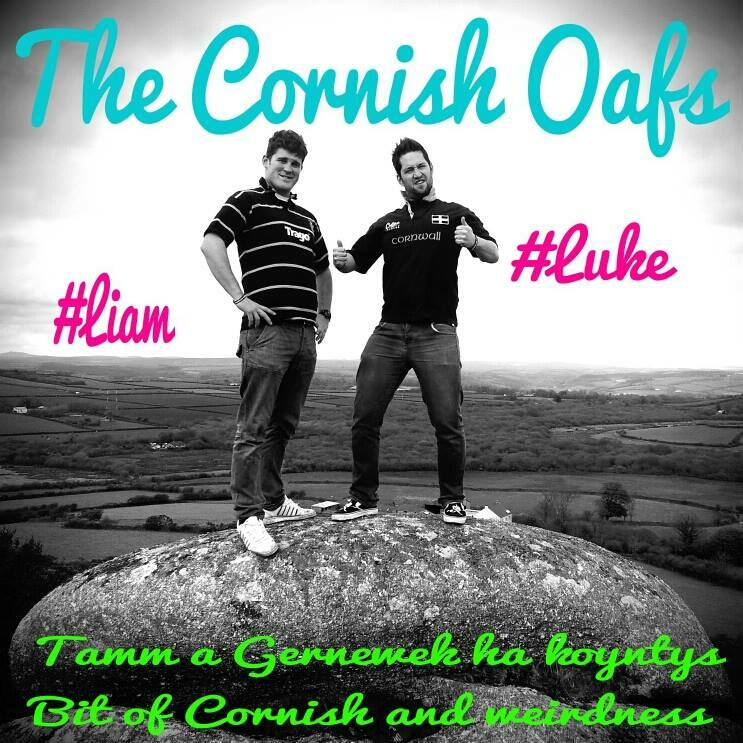 I interviewed Cornish Oafs online (Still recovering from a broken leg), to give people the chance to find out a little bit more about them, to find out the inspiration and what Luke and Liam really think about the dreaded tourist season in Cornwall. How and when did you boys meet? Luke: From memory when we were in our very early teens via our mutual friend “Big Dean”. Liam: I was friends with Big Deans younger broseph Sean and we used to go round their house and generally play games on the whole range of computers they had (Dreamcast, N64, SNES etc) and discovered new awesome/turbo strange music in between going to Morrison’s and spending pocket money on chocolate frijj’s. Somewhere in between as Luke says, we became turbo-budz. Luke: Yeah Dean’s house was where a lot of us used to hang out and me and Liam found kindred spirits in each other due to our shared weird sense of humour. And when did you two think up of the idea to make youtube videos teaching Cornish language? Luke: I was speaking to a good friend of mine that was working for Maga (the Cornish Language Partnership) who was saying something along the lines that they wanted to get something out there about basic Cornish phrases if people wanted to use them on St Piran’s day. She then suggested that maybe I could do something, I immediately thought “Liam would be up for that!”. Liam: Luke spoke to me about it and I was interested in the idea, and knew that it was possible because of the funny vids Kernow King was chuckin on Youtube. So we formed an idea for a video which is “a few phrases” which as you can see is our first tentative foray into the unknown exposure of Youtube, which spurred us on to do more videos. Liam: Just to have an unconventional approach to getting the language out there and try to splice some of our humour in there to make it a unique learning tool. For some reason I can pretty much quote any of my favourite comedy films word for word, so for me without even trying to I pick up on every detail in movies or scenes that I like. So when making our first few vids we unconsciously decided to chuck in things that we thought would be funny. Luke: Other than the inspiration mentioned before about starting it, I suppose some of the inspiration comes from Kernow King in the way that he’s got out there circumnavigating the standard way of doing things. What he does is Cornish comedy, by a Cornishman for Cornish people (and people that are familiar with Cornwall !) and has got popular without first having to please other media-type people first. Liam: When you look at that happening you realise you don’t need to make something that everyone in the media etc will understand and enjoy, you make something that you and people similar to you enjoy. That’s why it’s so cool to have the ‘likers’ and so forth that we have, you realise there are actually other people that are interested in Cornish stuff and have a weird sense of humour! You recently collabed with Kernow King, what was that like, and will all of you be doing more stuff together? Liam: It was one of the best and most surreal moments of my life really. Driving down Camborne in early June of this year (on me own, Luke came down with me and filmed on another day) I didn’t know what to expect, so on my tod I walked into the Clipper Bar as directed on the phone by KK, and I see James from the Motion Farm in a bomb disposal style filming suit, KK’s in there discussing the next scene with James along with the ansum Brandy Brewer, sat at the bar with a Lambrini and Jeiger-bomb. It was basically an awesome catalyst for a turbo-splann vid! Luke: For me, it was really good and thoroughly enjoyable, mainly because KK is a really nice bloke and we have a lot in common with him in terms of background. We all had a laugh together when we were filming our bits. The bloke he has from the Motion Farm that does the filming and editing etc is nice bloke too, not to mention really switched on creatively as well. How did you learn the language and did you find it tough? Liam: I originally had a small grasp of the language, but it is Luke that has taught me the majority of what I know. I do try to pick up new words and phrases when I get the chance, although I can hold my own in a conversation, I do wish to master it in the future. Luke: I learnt what I know of the language so far from friends that I know that speak it. I was lucky enough to randomly meet some really nice Cornish speakers through a job I had backalong. In terms of finding it tough; the beauty of it is that there’s no time limit or whatever to learn as you learn through cultural enjoyment of being able to speak your own language. You can communicate fine with all your Cornish friends and family in English with no problem so it’s all good. So just take your time and enjoy it; when you have a good enough grasp to have a conversation you get a real buzz from having a chat with someone in Kernewek! What is the importance of the language and do you think we should have more bilingual schools? Luke: The language is important to me but I don’t expect other people to have to share the sentiment. What I do think is important is that if there are Cornish people (and people that live in Cornwall ), that want to learn to speak Cornish I think there should be public provision for that. People that want to learn or want their kids to have a chance to learn need to make this known and openly support the language. That’s what is so nice about doing these videos; they are just a window into something much much bigger that a lot of people seem to want to have vision of but can’t find a way in. How do you feel about emmets and the havoc (sometimes) they bring down here? Luke: I think it’s a bit unfair dealing with all types of tourist as the same, really. Someone from an English inner city (or anywhere for that matter!) who wants a chance to spend some time away from their environment for a few weeks is a bit different to the kind of person that buys up second homes etc that force indigenous people out of whole areas. Liam: I just think they should pay an extra local tax (assuming they have a second home here, because they only contribute to the county financially for x amount of months and they are in some circumstances taking a local persons opportunity to live in the town they grew up in away from them) to subsidise the relatively poor income that the lower salary Cornish people have. It would be a small price to pay to have a home in the lovely Duchy of Cornwall. But for holiday makers I say explore and enjoy! Luke: Also in my opinion I think far too much emphasis is put on tourism as in income for Cornwall . If you look at Office for National Statistics cold hard data you soon realise the actual income to the Cornish economy is somewhere in the region of 10% – 15% (bearing in mind most tourism jobs are not very well paid). The thing is I think that tourism is so easily marketed so the tourism industry has an easy opportunity to put the message out that it’s more important than it really is for its own benefit, the media jumps on the bandwagon and no one questions it as not many people want to sit down and go through the numbers themselves, they prefer to be spoon-fed information by the media who have their own agendas. Therefore Cornish people and people who live in Cornwall are expected to put up with all the hassle of having the tourism without complaining or expecting more in return, or have more effort spent on pursuing other avenues for business. I’m not sure of a clear solution but I don’t reckon Cornwall will be taken as seriously as it was in its industrial hey-day if it’s constantly portrayed as a quaint holiday destination where cultural separateness from England is only allowed as long as its part of some wider branding of Cornwall for tourism purposes. Also, how do you feel about the issue that not a lot of the rest of Britain know about Cornwall ‘s independence/real culture and would you like to change that? Luke: I think if you have to keep telling the rest of Britain that we’re different without them realising it off their back, something’s wrong. I think we should just crack on with the continuing interest Cornish people are having in their own roots, history, culture etc and if other people outside of that note it as different and interesting then bonus for them. I don’t think our ancestors agonised too much over whether people marked them out as different, I think visitors decided for themselves when they came here! I don’t think there’s any thing strict to define what is and isn’t Cornish. If you’re Cornish, you’re Cornish and you shouldn’t have to justify that to anyone. And lastly, where is your favourite spot in Cornwall? Liam: Daymer Bay or Constantine Bay. And there we have it! Now all you Cornish Oafs fans out there know their background, inspiration, and how they feel on the relevant Cornish topics that are constatly a topic throughout our Cornwall.